Well done, great week what were your highlights? Thanks Simon, we’re pretty happy with how the week went in general. My highlights were third day of competition, we knew we had 3 potential knock out games against three strong teams to finish the group and we smashed it. The Portugal game is also probably a bit of a highlight, the result was tough to take but the fight back the team showed and the emotions during that game were something else. The experience of staying in a 90th floor penthouse walking distance from the fields with the team is something that will be hard to forget. In 2013 you had a surprise loss in the 1st round, this time around Portugal not exactly a ‘shock’ as they are a good team, but anything you would have done differently in that game or any of the others? The loss to Poland in 2013 was the best thing that happened to us at that tournament. We entered off the back of a strong preparatory season and were probably somewhat complacent going into that game. Poland went up 5-1 by being more intense than us. They hit us like a freight train and by the time we recovered it was too late to take the game back. The lesson we took was that we need to start every game at 100% and try to do what Poland had done to us. The context in Dubai was very different, we were the higher seeds in the group, but our preparation and team pitch time coming into this tournament was very different from 2013. We had seen Portugal playing in Lisbon and knew they were on form and had a deeper squad than in 2013. The way we started the game was a bit of a shock, but a close final score was to be expected. For this game I think we were a little bit preoccupied with our opponents. We knew they had a couple of superstar players and what they liked to do. We focused too much on our opponents and less on ourselves so that we ended up starting with some nerves and unforced errors instead on being intense and hitting the field with confidence. Was it tougher playing so early in the season, with less prep time? The timing certainly provided some challenges. Having major tournaments in late summer gives you a good 9 months to prepare, and all the regular top competitions are at your disposal to get playing time together. In 2013 our objective was to make the most cohesive team possible by playing 3 tournaments (25+ competitive games together before the actual championships). This time around due to the short preparation time and high cost of the tournament we had to get the team on the same page before the championships without raising the cost or commitment to a level that excluded the top quality players. We had no trial, a couple of training days in Sutton and the majority of the squad made it to a warm up tournament in Lisbon. The first time the entire squad of 17 played together was our friendly against Australia the day before the tournament, not ideal. 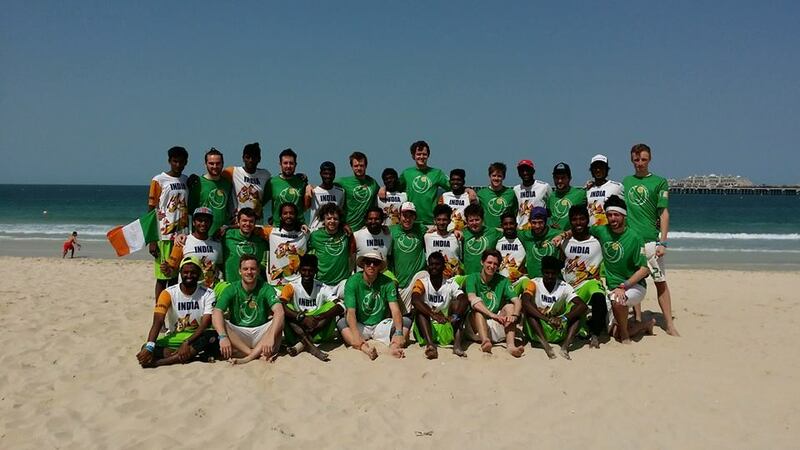 Did playing in Dubai make any difference or much the same as in Europe? In terms of playing, organization the tournament was delivered with the same quality and professionalism as ECBU or any of the best European tournaments. The only differences were off the field, the context for the tournament was so different to Europe. None of us had been to Dubai before so we spent the first couple of days craning our necks at the buildings and taking in the mix of culture Dubai has to offer. The heat was a challenge with a couple of players suffering during the tournament but it wasn’t as bad as Worlds in Italy in 2011. You had some turnover from 2013 team, about 1/3rd maybe? Did that affect things, or not? We only had 6 returning players from the 2013 squad, only one of which was female. However the vision was very much a continuation from the 2013 experience. The basic plan of playing to the strength of our women on O and a mixed bag of strategies and lots of intensity on D. We lost some of Ireland’s most experienced women, many of whom have since retired but the talent that stepped up in their place was equally impressive. The average age of the team dropped dramatically. Also the clubs where the players came from were a lot more diverse than previous times. The youth and broad range of backgrounds and skills changed some minor parts of these plans. For example we played a lot of Zone in 2013, what we learned early in the season was we were a lot stronger on man D so we focused on that. On O our girls were moving the disc up-field a lot more and throwing and scoring the goals between themselves as opposed the male thrower to female receiver trend of 2013. 7th is pretty awesome, especially in terms of getting out of the first pool. Do you think it could have turned out any different by avoiding the loss to Portugal? We never set expectations or goals before the tournament. We wanted to go out and execute our game plan and see how far that would take us with the limited preparation time. USA, Portugal, Russia, Japan, Australia and Switzerland are big names and our high seeding put a target on our backs. We started the Portugal game nervous and we paid for that. Having said that there were no “Easy” quarter finals. The top 4 of the other pool was just as scary. Beating Portugal would have given us the Philippines instead of Canada. It’s hard to tell what that match up would have been like. Personally I was very happy to make it to the quarters but frustrated that we didn’t have a stronger performance against the North Americans. Germany World champs, did you predict that one? Glad a European team did it, any sense it could have been you guys, or were they a stronger unit than the 2013 version? I don’t think any of us predicted that one at the start of the week. I’m delighted for them they played an unreal game in the final and thoroughly deserved the victory. I think we would consider Germany, as well as Portugal and Sweden to be our peers in Europe, and seeing one of your peers win world’s obviously makes you imagine yourself there. 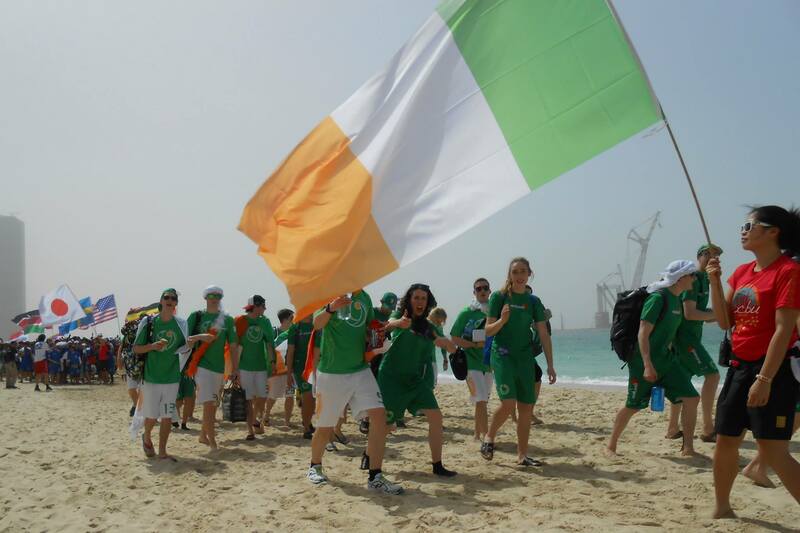 In 2013 we played the Germans at Paganello (and won quite convincingly) but the Dubai German Team was light years ahead of the team we played then. With the team and preparation we had this time I don’t think it we could have been there instead of Germany. Ireland are still a long way off but it’s not beyond the realm of possibility for a future Irish team with the right preparation to take down a North American team. Canada seemed to improve across the week, across several divisions, finding their sand legs perhaps? Do you think a European team could have taken down the US too? I’m not certain but I believe the Canadians were from across the whole country so I imagine preparation as a team before hand must have been near impossible. They certainly had talent so I’d imagine it was the team gelling with every game they played. They also managed to get their semi against the US on the very windy day which I think equalised things a little bit. Having played both the US and Canada I have to say I was much more impressed with the US strength and depth compared to the Canadians. The US defence was completely smothering and their O was clinical whereas with the Canadians we felt more room to manoeuvre and a closer contest. What’s next for Irish beach? Worlds will be back in two years. They’re changing the rotation so that it doesn’t clash with other international events. Location is TBC. I think lots of us would be up for giving it another bash in the mixed division. 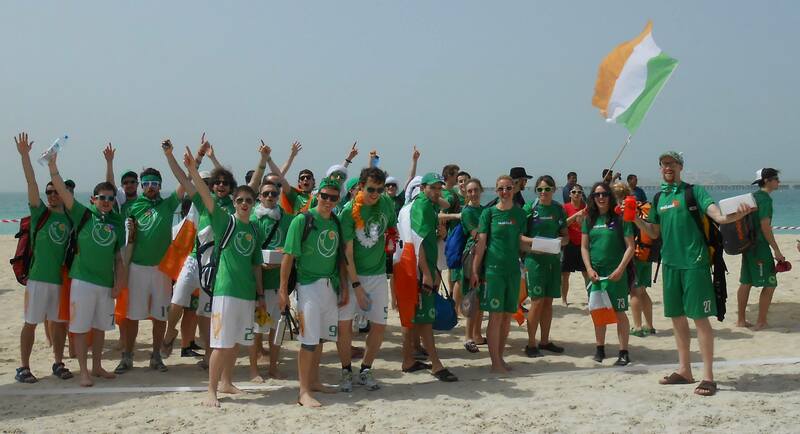 Domestically, this year on Sept 18/19th we’ll have the first All Ireland Beach Championships which is being pushed by Irish Beach Ultimate. The idea is to get an event in the calendar and see some domestic beach take off the same way indoors has grown in recent years. 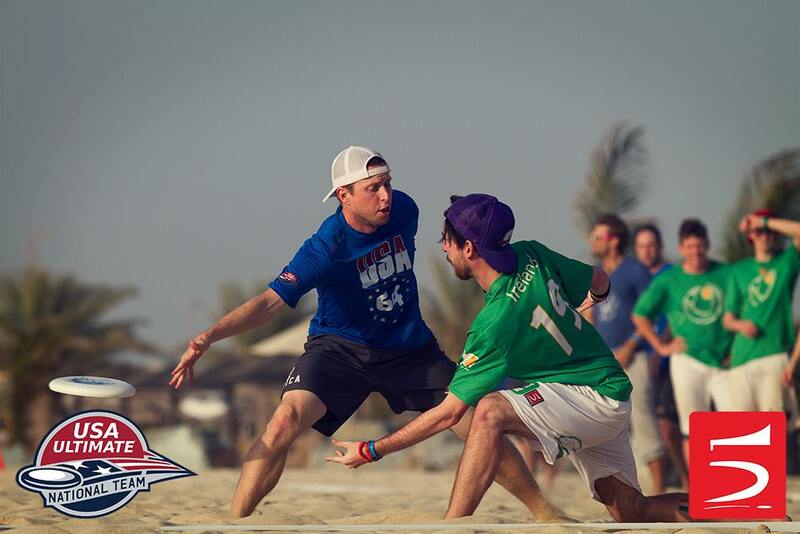 The ideal situation is that by 2017 a lot more players will be playing and interested in Beach ultimate so we can send more teams with more depth. And you, do you now look at grass again? Warming up for my first grass practice after Dubai felt very strange. I still play grass and still love it, but beach has taken over as my number one. I will even be putting my body through a week long grass tournament this summer at EUC in Copenhagen playing with Spain mixed. Being Spain based, why do Spanish teams not make it to worlds as often as other nations? The short answer is money. 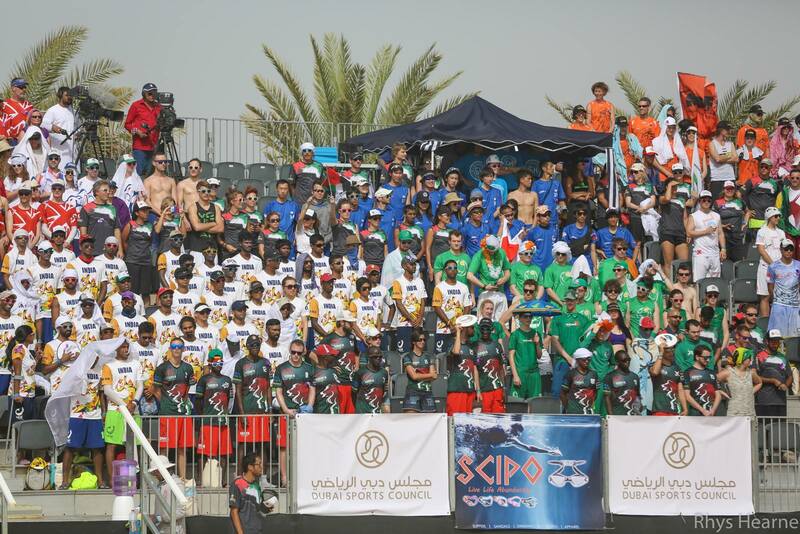 Spain had a team in every division at Euros which was in Spain, however for Dubai there were no projects put together. There was some interest but the cost of the tournament and the timing made it hard to get sufficient numbers. Instead in 2015 there’s a lot more focus on EUC. Spain are sending teams to 5 Divisions in Copenhagen. What is the depth / strength of Spanish ultimate relevant to Ireland, or even Portugal? I think the Spanish and Irish communities are very different. 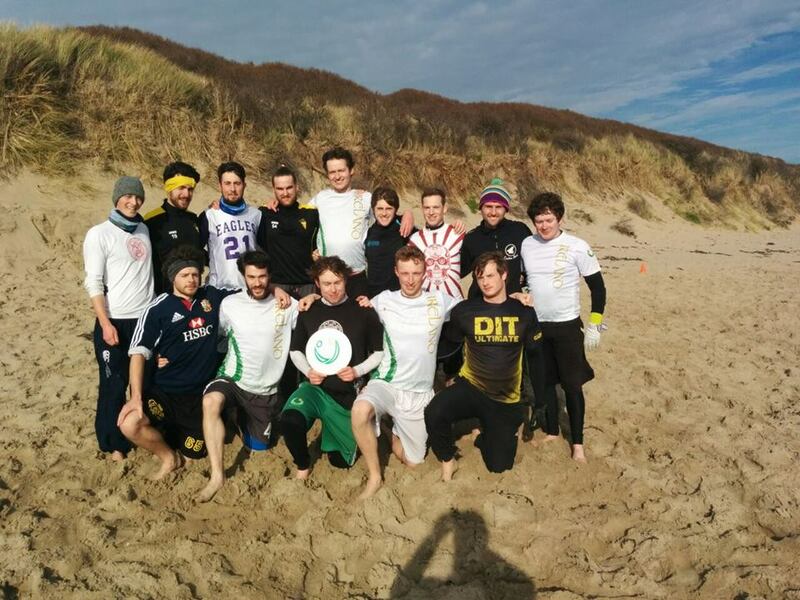 I would say Irish Ultimate is much more organized and growing faster. The university and schools / juniors set up in Ireland means that every year there are more and more players being trained by better and better coaches. In Spain there are no university clubs, and while school programs have really taken off in the last year (especially in Catalunya) the results of this work wont be seen for a while. Player growth in Spain is competitively slow. Ireland has also benefited from being so close to the UK. Being able to travel to Tour every year is a great and inexpensive opportunity for Irish Teams to learn that you just can’t replicate here. In terms of the quality of players there are some great teams here. Corocotta from Santander, Quijotes from Madrid and Mubidisk from Lanzarote are the three that dominate domestically and have put in some quality performances at European / Worlds level. One big difference is that with most Spanish teams the average age of players is a lot older than in Ireland. Because there is less organic growth in the community most clubs best players are over 30 and have been playing since their club was founded. This is exemplified by Spain having an Open Masters and Women’s Masters team at EUC. I’m less familiar with Portugal. 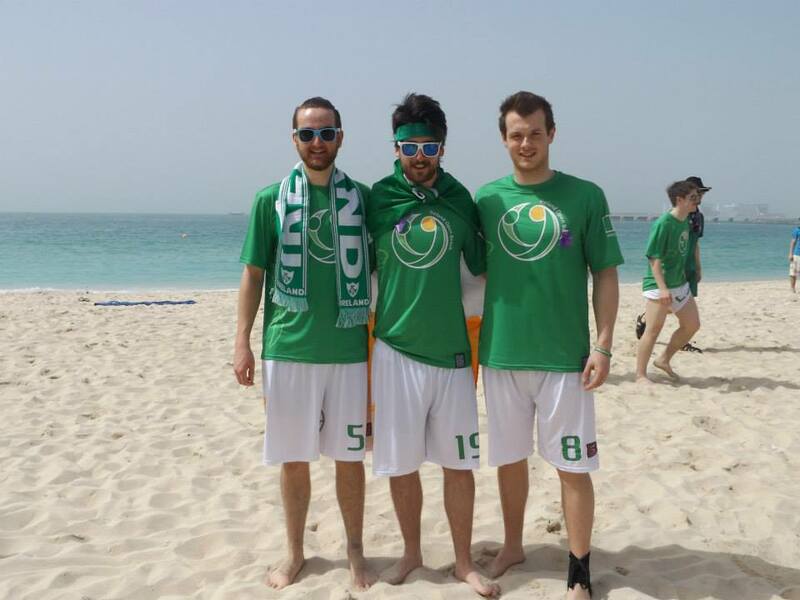 I know they have strong clubs like Bufa who play the big Beach tournaments in Europe helped along by some strong foreign players but domestically as far as I’m aware their club scene is growing but wouldn’t have the depth that Ireland and Spain have. I would liken them to Ireland Open in 2007, where the community was of a size that allowed a couple of very strong players to build a team that played and trained together to the point that the team was stronger than the sum of it’s parts. How was Dubai in general? Dubai was really strange. We stayed in an Airbnb penthouse apartment on the 90th floor of the Princess Tower. (The tallest residential building in the world) It was 15 minutes away from the fields with spectacular views of the marina and Palm Jumeirah. The jacuzzis on the 5th floor were put to use nightly. It’s a really strange mix of everything, cultures from all over the world, western consumerism and outlandishness expensive displays of wealth, because ‘why not?’ I don’t see myself going back there any time soon but I’m happy I got to experience it even for a little while. Are you done with beach, or already looking at next WCBU, in 2017? Definitely not done with beach. Word on the street is that the next worlds is in 2017. I’d very much like to be a part of that project in whatever way I can and I know Sam and some of the team are already into it. Here’s hoping it’s somewhere in Europe. What else should I have asked you / would you like to add? Our kit was sponsored by an Irish company, Nurse Jobs Ireland https://www.nursejobsireland.com/ so a big thank you to them. I’d also like to thank the community for the support they showed us and the open team during the tournament. The messages of support are really touching and mean a lot. Congrats on being captain ! How has the training been going? Thanks Si! Really excited now with less than 2 weeks to go. Training has been going quite well despite the time of year. We’re all finished now in terms of training after 4 weekends together plus the trials, so things are looking good. It must have been a bit tough having to train over the winter to peak for an event so early in the season, especially as it is on sand, winter sand, wet, cold! I was not looking forward to winter training to say the least, but we were pretty fortunate overall. Temperatures were decent enough, and it hardly rained at all. Wind was a bit of a problem, but that’s to be expected any time of the year, especially on a beach. One day we had brilliant sunshine, but it was so windy we couldn’t play, so we did an indoor session instead. It’s a great spot that not too many people seem to know about. Good, flat beach for Ultimate that’s right on the DART line. Not too many shells or seaweed either so you can pretty much play straight away. Lots of friendly dogs running around though, which can be both adorable and annoying. Our last training session was actually in Rush, which is a great spot. Took a few minutes to clear it of shells but the sand was perfect. Ireland really does have some great beaches. Just a shame about the weather! Have you played any warm up tournaments with the team? We were going to go to a tournament in England in January, but decided the cost probably didn’t outweigh the benefits, especially since conditions were essentially what we were playing in at home. We were going to go to Lisbon MOW with the Mixed team as well, but they had to cancel the Open division due to lack of interest. Would have been a great opportunity. 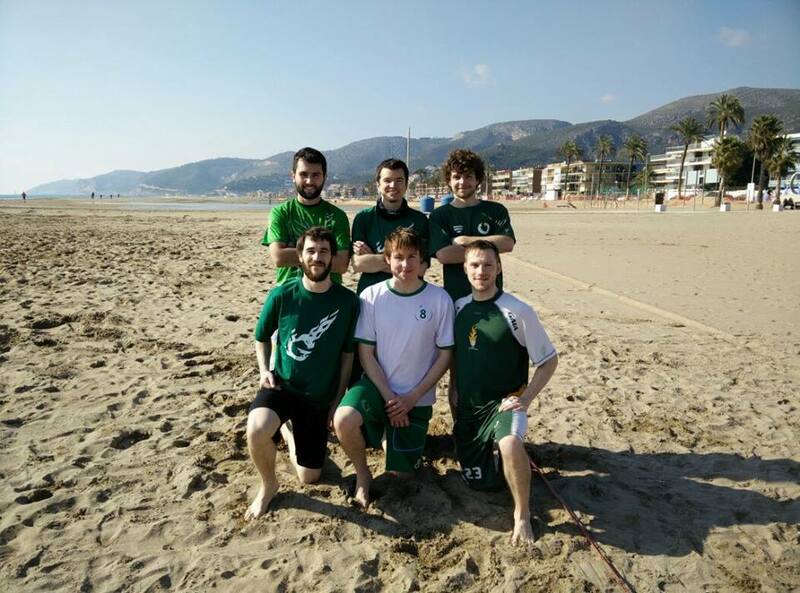 Six of us managed to make it over to Barcelona for an Iron Man tournament, which was a great experience and we took a lot from it. Playing in warm weather against opponents who were used to playing on a Beach showed us what we needed to work on for Dubai. What are you hoping to achieve at WCBU? As much as we can! 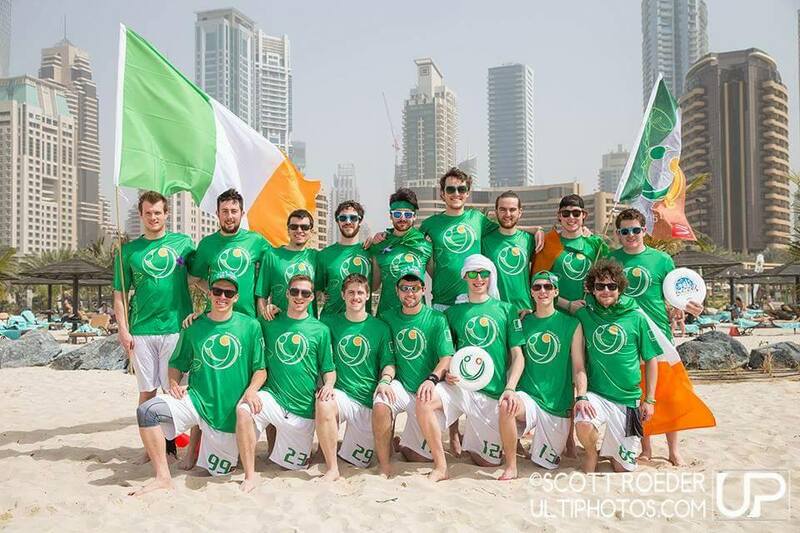 It’s a great opportunity to showcase Irish Ultimate to other countries, and also play against some unique styles. When the tournament’s over I just want everyone to feel like they had the time of their lives and that the results went as well as they could for us. If everyone’s happy at the end of the week, I’ll consider my captaincy a success. I always love to play teams from outside of Europe since I rarely get to do it, and we’ve got a few of them in our group: Japan, India, Singapore and the Philippines. Australia is also going to give us a friendly before the tournament apparently, which will be a great way to prepare. Every team we play will be unique, and it’s always more special playing another nation while representing your own. 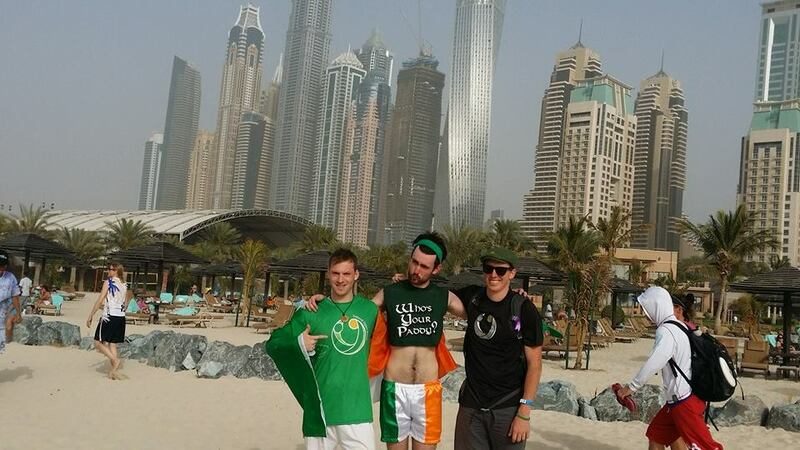 Have any of you been to Dubai / What do you think it will be like to play there? I don’t think any of us have, besides maybe a lay over in the airport. I think it will be amazing to play Ultimate in a new part of the World and also see some of the amazing sights there. I’m sure the beach is immaculate as well, and the weather is going to be magnificent. What’s your approach to the local laws? Obviously we’re going to try to stay out of trouble. It seems to be a very forward thinking city, especially when it comes to western tourists. There’s even a Fibber Magees which we’ll have to investigate (and watch the Six Nations at). I’ve always thought sport and politics should be separate, so I’d be happy to play Ultimate in any country regardless of the laws there (within reason). After all, there are plenty of Irish laws I don’t necessarily agree with but I love playing Ultimate here. Will you be off alcohol for the week? Some of the lads will be, but I won’t be placing a ban on it. Obviously too much alcohol is detrimental to performance, so I’ll probably limit the amount we’ll be drinking during the actual tournament. People have invested a lot of money and time towards this tournament to have fun but also do well, so I’m sure we can meet a happy median. I plan to wet my own whistle during the tournament as it’s a great way to relax after a hard day, especially if you’re on a beach! Who do you think will contest the final in your category? I’m going to go out on a limb and say Great Britain and The Philippines. GB because they are mostly Clapham players who know each other, as opposed to the USA who seem to be just a mix of great players who may not have much experience playing together. The Philippines because they live and breathe beach. If those teams meet in the semi finals, I think the USA are an easy bet to make it in. Obviously Sweden looked great at ECBU, so I’d expect them to do well in Dubai as well. I’d have to say the USA will probably win though. Where do you think / aim / hope to finish? Obviously as high as possible, but without knowing too much about the other teams it’s hard to say. The Irish Open Beach teams in the past haven’t done very well, so I’d be happy to improve on past performances and get a few scalps. The Mixed team have a lot more experience, and it’s hard to know if other countries’ strongest players will be on their Mixed team or on their Open/Women’s teams. The Mixed team was well ahead of the Open team at ECBU, but I think we have the talent to make that gap smaller. If you’re reading this, don’t be afraid to show us your support on social media or however you can. It could make all the difference. That and go out and play some Beach Ultimate! Come on Duboys!